Wow, I think I saw what I think I saw. We really have to start talking about visualizing data in a WPMu/MediaWiki environment. I will be blogging some semantic stuff I really don’t understand shortly, because you inspire me to no end. I gotta get me to a remedial digital literacy class, like, yesterday. This is amazingly cool; thank you! I wish I’d have realized that was possible when I did this with Jim Groom. It would have saved me a lot of time and it’s just such an elegant way to do it. Brilliant and really transparent. Following your example, now anyone could do this if they wanted to (as I have done). Thanks. Thank you for sharing. That will be very usefull. Amazing mashup. More importantly the =import function in Google spreadsheets is an amazing tool for building data sets for visualization and mashup projects, thanks for some killer knowledge. Been reading your blog for a while and this just made me shake my head… am amazed and do agree with Brian thanks!!! Very smart, a great example of using previously disjointed assets and creating a new way of collecting and sharing data. Thank you. Tony, you did a fine thing indeed! I’d like to see, for example, more transparency in our local government here in Katrineholm, Sweden where all documents (invoices included) with the exception of those involving personal privacy are online. Now, you offer interesting possibilities for information gathering and online publication via Wikipedia and then with Google Docs. Really, you did an excellent job Tony. Most impressive. Awesomely nifty! Really good stuff. Really cool stuff. This is what web 3.0 should be all about. Integrating services. The disadvantage in having so many pieces is that you have little control over how the flow should update the end results. If you want to publish data real time, you’d want to see it as fast as possible on google/yahoo maps. This is where some more work is needed. Or Yahoo then Google map. Tried duplicating your example but for some reason i always get a parse error ? I would like to do something like that with data from Yahoo Finance (and/or other source) for end of day market data (indexes, trading volume, advancing and declining issues, new highs/lows, etc.). Anyone can/care to help me with that, please get in touch through the contact form on my blog (linked to in this comment, I think, but if not go to http://www.chrisco.us). Would be a paid freelance project, of course. That’s some really excellent work. Great job on the write up as well. Wow… I think my head just exploded…. That’s impressive. 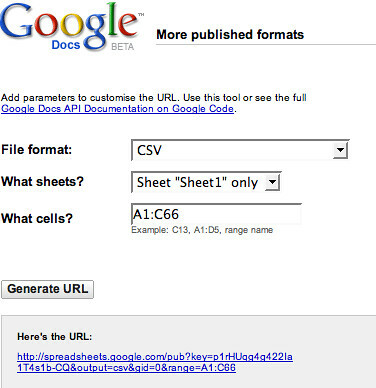 I didn’t realize you could pull data in that way from a webpage in Google Spreadsheets. Nice implementation to get it to Google Maps. how do you make sure the data you are using stays current? for example, if i took it from another website and put it on a map. @katrineholm Uncensored – does your council have any web pages we could start to scrape? @chrisco – I’ll be posting a follow up post in an hour or so that may be of interest? 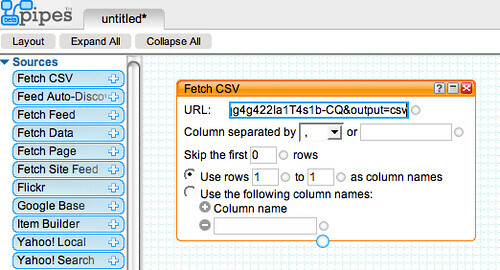 The Yahoo pipe will also cache the data being pulled from the spreadsheet in the csv file. Of course, superficially this is fine. But if you start to look at the data, it’s rather problematic. 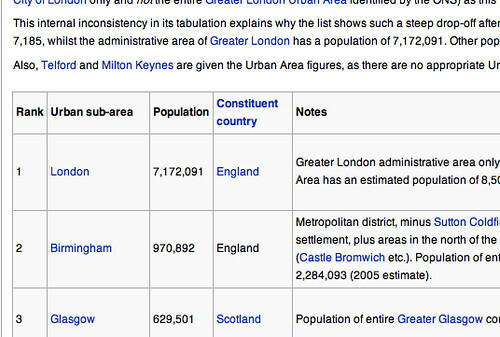 I was surprised to see that Manchester was listed as smaller than Bristol, of all places. 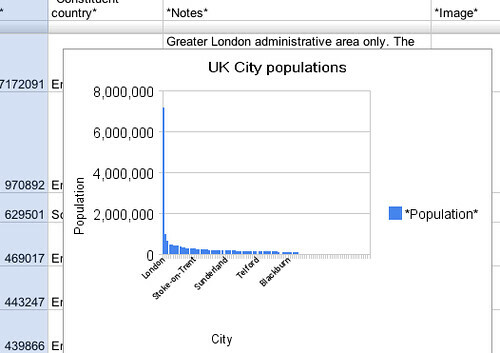 It was only by going to the Wikipedia page that I understood the way in which the statistics were gathered. In short, a lot of information has been stripped out in this process. I don’t see much in the way of gain. And in fact, it’s become very misleading. Or to put it another way (and in case I didn’t sound grumpy and fuddy-duddy enough the first time), the result is a USA Today style graphic, with all the apparent virtues of clarity but the real vices of decontextualized data masquerading as information. Worse, it’s framed as a multiple-choice “pop test” as though it had some kind of educational value. It doesn’t. It’s miseducation. Well, your mashup recipe provides an excellent case in point of the ways in which data gets used, abused, and inappropriately visualized. The problem is not with the Wikipedia page, but with the way in which the information it contains has been repackaged. Again, in devil’s advocate role: where’s the upside here? Agreed – as I just posted in a reply on Brian’s Abject blog, I should have explicitly stated the provenance of the data in both the spreadsheet and each description element of the feed generated in the pipe. Pingback: datatube « Greg Is Overcritical Of Himself And Lots Of Other Things. I second Brian:digital remedial literacy class for me too, because that looks seriously cool. It would be neat to export the chart or map as an image, and import it into the original Wiki page, so that whenever someone updates the table on the Wiki, the map & chart are automatically updated too. I’m sure there are services which will take a screenshot of a web page. I don’t know how to export the chart, or if Wikipedia allows images to be on another site. I think the phrase is ‘well impressed’. The bad news is I just wasted two days doing some tedious longhand stuff! Thanks for this post. Hamarja,aisob ki lekhcos?kicui to buzte parlam na!! Very cool mashup. Thanks for the great writeup. I think it’s worth pointing out that while Google’s importHTML is very cool, for many purposes selecting, cutting and pasting a table from a website into a spreadsheet (Excel, OOCalc, or Google Spreedsheets) in the standard manner will the do the job. Tony, I’m sorry you see this as arguing. Again, however, it would be great if someone, anyone, could tell me the upside. @dave the problem with cur and paste is that if the original table changes, your cut and pasted data is obsolete (unless the cut and paste cuts’n’pastes a reference to the table that is then imported behind the scenes). A comment on the follow-up post to this one – https://ouseful.wordpress.com/2008/10/16/visualising-financial-data-in-a-google-spreadsheet-motion-chart/ – attempts to work out just how frequently the spreadsheet does update the data. Tony – I’m glad you mentioned that you had posted a comment on my blog – I had yours and three or four others inexplicably in a junk folder, which I hadn’t checked in weeks. Jon – I took a crack at describing what I see as the upside in response to your comments on my blog, and linked to an article I wrote last year… I suspect it will fail to convince you, but I hope it will give a sense why this is interesting to some of us. It would be marvellous if the argument could move on, but it doesn’t seem to me that you are willing to look at the issues here. It’s shiny, shiny. And worse than useless: it’s positively unhelpful. No wonder people’s heads are exploding. It helps if you don’t actually think about what’s going on. hey so much confusion can u clarify please? 2) Part of the point was to just document for myself some whizzy techie wiring for a workshop session I ran yesterday, and rehearse a demo to finish off the session. I’ve sat through that many dull cubed presentations, I’m trying to develop my own presentation skills (a long hard slog if you’ve ever suffered one of my presentations) and figured for the w/s I needed to try and finish with some buzz in the room. Shiny shiny…. but that’s okay, because no-one remembers anything from a presentation, just whether they came away happy, dazed, bored or enthused. 3) Value generating and information displaying enterprise mashups are arguably on the way (e.g. http://www.forrester.com/Research/Document/Excerpt/0,7211,44213,00.html ); and one reason (IMHO) for this is that the barriers to entry in terms of usability are being lowered by the experimentation that’s going on in the public and beta web. Unfortunately, most people have no idea about what the hell a mashup is – not even the very idea; (this R/W/W post provides one way of trying to explain what mashups are about in an accessible-ish way: http://www.readwriteweb.com/archives/forrester_enterprise_mashups.php ) So the demo was in part to try to get across some the relative easy (and getting easier) process techniques available for putting these things together (pipelines, data transformation, etc), and leave me with an opportunity to say: “so that’s a mashup” at the end of the session. I didn’t touch on stripping away the context and maintaining provenance info in the post because that would have BORING and is best saved for a later day – when people are at least thinking about what the consequences of mashups are having seen one possible example. Tony, got your comment on my blog. Thanks for the inspiration. I ended up using Pipes to clean up a feed of market information for the game Eve Online, fed it to a Google Spreadsheet, and use it to calculate profit margins on the production of pretend ships and pretend guns. Here’s my pipe and here’s a snapshot of the spreadsheet it feeds. Not really a *real* application, but its certainly useful within the pretend world of Eve. Chris: I love your pipe, not sure how to use it yet though. I started today thinking I would find a way to get up-to date prices for materials needed for POS operation. I think where i’m stuck on is where to find the typeID of the item i’m looking for. My spread sheet is set up at the moment but not sure how to pull the info in. Yes, you’ve given an example. And I’m now asking about the consequences of this process. I think that, certainly for this example, they are uniformly negative. Which is why I was asking if there were any upside to this representation of a partial, decontextualized dataset in a new environment. Again, I still see no advantages, while I see many, many disadvantages. No doubt you’ll think I’m exaggerating, but I think that this post, and the reaction to it, is profoundly discouraging. I’m sorry to be the drag on the “kewel” party by talking about what’s so damn “BORING.” But it seems to me to be important. I’ve written up some further thoughts here. 1) I think the issue is about more than provenance, though providing provenance would certainly be a leap forward. We’re agreed on that. We also agreed that at least some mashups can “strip provenance info and context away from data.” But I should make it clear that I’m not against mashups per se. Some can definitely enhance rather than degrade both data and understanding. But I do think that this question (as to whether there is enhancement or degradation, or more generally the effects of the various transformations undergone in a mashup process) needs to be front and central at all times. It would seem that that’s our basic disagreement: you want to postpone that until some unspecified later date; for now it’s “BORING” and beside the point. Again, I strongly disagree. Postponing such questions is (as I say on my blog) a textbook case of data illiteracy. Moreover, I’m disappointed that enthusiasm is allowed to overwhelm critique so easily. 2) I like interesting presentations, too. I disagree that thinking critically is necessarily boring. And I don’t like presentations that are whizzy but lack substance. 3) I’d like to believe that “value generating and information displaying enterprise mashups are arguably on the way.” I think, however, that the links you provided are rather worrying examples of quite the opposite trend: “there is plenty of money to be made selling mashup platforms. . . . Those vendor strategists that move quickly, plan a mashup strategy, and build a partner ecosystem will come out on top”. Ugh. That’s certainly a different definition of “value” than the one I would hope might come out of such tools. Ugh. And learning should be fun. But all that is fun is not learning. 4) Techie stuff can certainly be bewildering. It makes some people’s heads explode. Hence the vital importance of critical data literacy, precisely so that people “start to think about what’s going on, there is some deeper stuff in there; like what sort of processing is going on in a ‘mashup’, and what the risks are.” I’m all for this. 5) See above for my fear as to what you may mean by getting “value” from data. Meanwhile, my more basic point is that it’s not so much a question of having quality data or not: I’m happy to accept that for this purposes the Wikipedia data is of sufficient quality. What’s at stake is the ability to interpret that data. Again, that’s what I consider to be the realm of data literacy. I’m sure that some mashups, and some transformations, aid in such interpretation. Others do not. But figuring out which is which is, again, vital. It can’t be postponed. 6) Finally, I’m all for a “visualisation education programme.” But again, my comparison with the USA Today visualizations is to point out that such education needs to have critique at its core. Not necessarily enthusiasm. Or rather, surely the point is to encourage enthusiasm for critique. That’s what I see my job, at least, as being about. More broadly, as I say, it’s what I see as being the role of the university. Ach, I just wrote a long comment in response to your six points. It seems to have got lost somewhere. Oh well. Tony, no probs. No conspiracy theorizing here! When I was kid, I did this kind of maps when I was at school, by using a table on some schollar book and a map. Who didn’t? What’s new? The auto-magical update through the pipes? How To Make Money In The Evolving Mashup Ecosystem. It seems the Web is becoming more and more a cash register, an entertainement place, than a place to share documents and scientific data. Nothing wrong with that, my job at work is creating commercial/entertaining sites for small/medium business. Really interesting. I”m looking for ways to integrate public data into my companies’ data warehouse. Thanks you for posting this. BTW: you can do that with MS Excel since Office XP (I think). Data->Import External Data->New Web Query. Click on one or more of the arrows to switch it to a green checkmark and press the “Import” button. 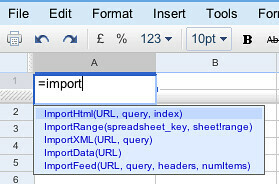 Works even with password protected websites, Excel will ask you for your login data when you open the spreadsheet then. Pingback: Zaubern mit Google Documents | der leumund. Do you mind if I show this off to people? If I have name and address only(Japan Language) , I would like to show location how can do. I try to do many an hour but Y Location not appears. You made me to study geocoding by Spreadsheets. Still you need Pipes for KML. Funny. 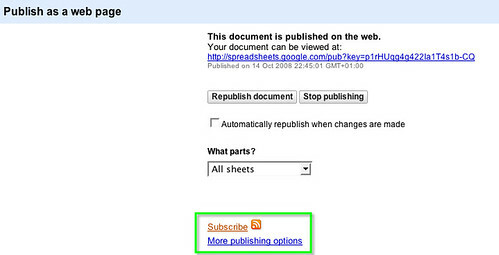 Has anyone figured out how to use a published Google spreadsheet as an external data source for Excel? thanks again. I wrote a german article in my blog about that. For those who are interested….. 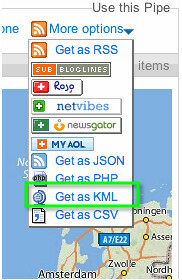 I can see that you geocode by Spreadsheets but do the KML conversion by Pipes. thank you, ESA – I mixed your proposal (geocode by google) with this one (kml by pipes) …. the pipes location extractor works better, when you feed it with longitude and latitude. Google nearly found every of those 52 cities (except of four). 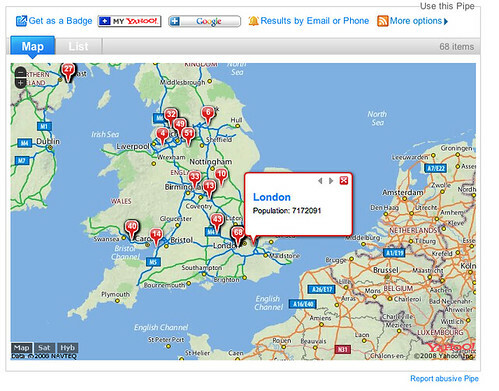 The last 4 cities where found, as I feeded google with city and country (not only city). Help ME PLZ, I do not known why map not shown , Please recommend Plz !!!! 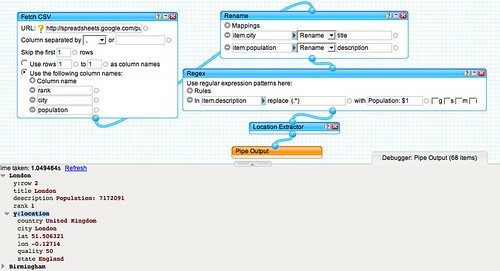 I confuse a thing , My pipe show Lat and long ,but when I run Pipe the map not appear , just show list. Thanks so much for this awesome post. The only issue I have is that the wiki I want to scrape data from is behind a firewall and cannot be accessed without signing in. I wonder is there anyway out of this because it’s RSS feeds etc cannot be accessed externally. I’m looking at some mediawiki extension that might push the wiki page data externally so I can then use google spreadsheet, yahoo pipes etc. Any ideas? Pingback: Abject Learning » Blog Archive » Is there a remedial data literacy class I should be signing up for? 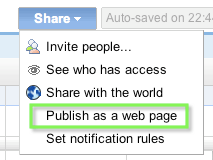 Can you pass pwd and user ID in url? I have tried to do the first step (importHTML) in Google Docs and it does not work with comma (,) separator, but changed to semi-colon (;) and worked fine. I wanted to ask if someone out there might be able to demonstrate how I could introduce into my map a third data point to display. Right now I have the location and name displaying but also need the date if at all possible. Any ideas? I wrote a blog post doing something related; how to create a server monitor using a Google Spreadsheet and a little PHP. I have some ideas about how to create some other stuff using approaches like these. This is plain lovely, and Jon’s comments are useful too. I’m curious why the resulting map on both Pipes and Google Maps only shows certain cities/towns? 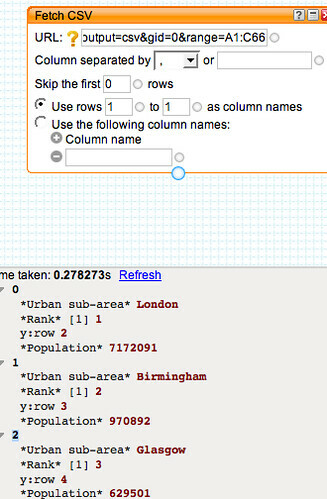 The Yahoo pipes geocoder is a little hit or miss, and sometimes doesn’t disambiguate or identfy placenames so well; if a placename isn’t recognised and geocoded, then that item doesn’t get plotted. That’s great! Otherwise you can go through APIs from services like freebase, but going direct means you get the most recent data. We went direct with our Wikipedia Google Maps mashup. http://maps.thefullwiki.org We went through the entire Wikipedia dump and created a map for each article showing each location. Thank you very much for sharing this info. I’m using Yahoo! pipes for quite a while, but I never thought to generate mash-up like this. Very useful. I will have a try just to make a bit more practice. 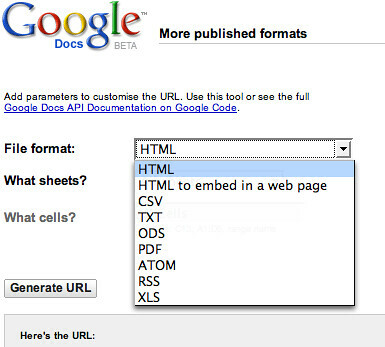 FYI: The formula for scraping with a Google Spreadsheet has changed (or there is a typo here). It’s =importhtml(“”,”table”,N) – ie there’s an “L” after the HTM. Hi, this is pretty interesting. Thanks for sharing. I have been working on a plugin for WordPress that helps to import data into individual WP posts. I am envisioning to use your technique so I can build a site quickly from data processed with pipes using your approach. Thanks. My blog has a lot of unique content I’ve either created myself or outsourced but it looks like a lot of it is popping it up all over the internet without my agreement. Do you know any methods to help prevent content from being stolen? I’d genuinely appreciate it. other. If you’re interested feel free to send me an e-mail. I look forward to hearing from you! Excellent blog by the way! Awesome. Now I just need to work out how to do it on a private (ie logon required) site, as I have loads of data i could manipulate that i can’t really get to otherwise, any ideas? in google docs, but it is not showing up correcting in pipes. Appreciate any help!! Very nice, elaborate tutorial. Decided to write one myself on leveraging ImportHTML() to make a cool map visualization of facebook usage data.